Facebook provides basic functionality to schedule a post directly in Facebook. However, it’s not easy to manage posts, especially if you’re managing multiple Facebook or other social media accounts. The one thing that’s nice is the ability to backdate a post, so it appears as if it was posted in the past. 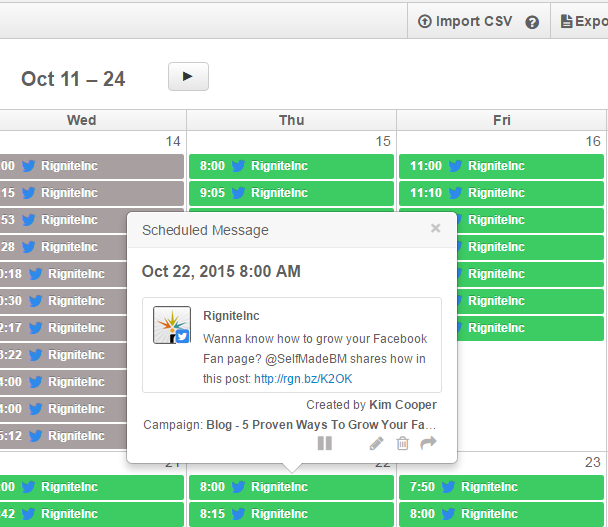 For businesses and agencies it’s useful to use a scheduling tool like Rignite. To sche dule posts on Facebook in Rignite you’ll first find where to create a new post. This is the Compose Message window, which can be accessed from all modules. If you include a link, you’ll see and be able to edit the link preview before it’s posted. You can remove the link once the preview is shown since the preview will be a link. You can include an eye-catching photo if you don’t include a link or if you want to replace the link preview with your photo. Schedule your post for the best day and time of day to post on Facebook for maximum engagement with your fans. Rignite provides its own shortlink service for shortening and tracking links. You can choose not to shorten a post, but shortening makes long URLs more pleasant to the eye. It’s also useful if you’re posting the same message on Twitter, with its 140 character limit. Posting the same message to other social accounts – Facebook, Twitter, LinkedIn etc – is easy by just selecting other accounts too. Rignite is a software solution that makes it easy to schedule, track, and manage your Facebook and other social media posts. Use Attractive Images. When people scan their news feed it’s often an eye-catching image which will attract them to read a post. Think about what will catch their attention, but make it relevant to your post topic. Find the Best Times to Post for Maximum Engagement. Pick times and days of the week when you know your target audience is online and engaged. Here’s an article to help your find your best times. Vary Your Content Categories. Use a well-planned mix of educational, informative, humor, inspirational and other categories of posts to keep your audience engaged. A general guideline is that no more than 15-20% of your posts should be promotional. Ask for Engagement. Don’t be afraid to ask your fans to respond. People will be more likely to respond to emotional or controversial questions. Consider Boosting Important Posts with Ad Budget. Because organic reach for your posts will be low, typically 1-3% of your fans, consider using advertising budget to increase post reach. You can reach your fans, their friends, or targeted audiences. One of the best ways to generate engagement on your Facebook page is to run a giveaway or contest on it. Giveaways usually have a randomly picked winner, while contests require some type of evaluation of the entry. In Rignite the campaigns module and wizard will guide you through creating your promotion. Find the Boost Engagement goal, and select Engage on Facebook to get started. Cross promotion on Twitter. If selected, Rignite will automatically insert the link to your Facebook promotion into your future tweets after your Facebook message is posted. Then you’ll se lect how frequently you want to schedule posts on Facebook and Twitter (optionally) and click Kickoff. 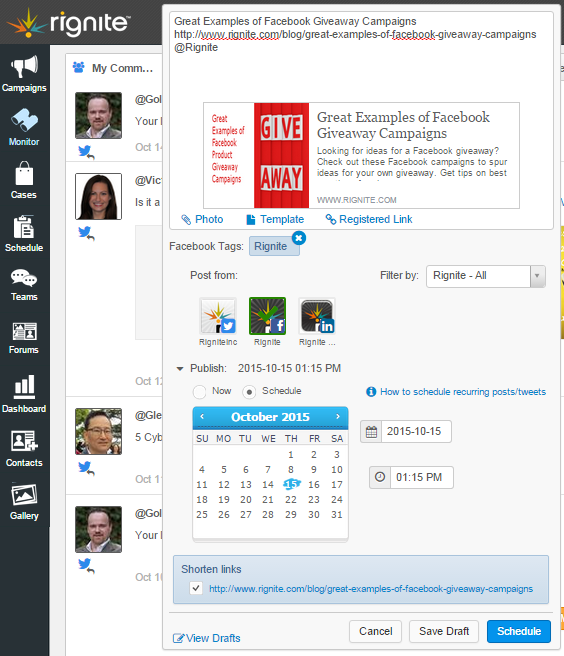 Your calendar will be automatically filled with promotional posts for your giveaway or contest. This alone will save you tons of time scheduling your posts, especially if your promotion runs for a few days, weeks or even months. Please note that asking people to share your post or like your page is against Facebook’s promotion rules, so these options are not offered in Rignite. Keeping track of entries is easy too! Rignite will automatically monitor your post for likes and comments and collect entries for you. You may even have several Facebook posts in your promotion, and Rignite will collect entries from all of them. After your promotion is finished you’ll be able to view entries and select a winner or have Rignite randomly select one. Rignite will even announce the winner(s) in your original posts and tweet it too if you’d like. During and after your campaign, you can see Campaign-level analytics and compare your campaign to others to see what works best. You’ll probably want to run other social media marketing campaigns besides giveaways and contests. For these, being able to easily schedule a series of posts on Facebook and Twitter can be a real time saver. In Rignite you’ll promote these events, blog posts, or other content with a series of posts. Your campaign might be for only a day or two, or last as long as several months. As with all Rignite campaigns, you’ll be able to create multiple base messages for your campaign. These will be rotated so that you’re not always posting the same thing over and over. You’ll also be able to automatically add Google Analytics tracking parameters to your posts. To create multiple posts at once, you can specify how many times to post your message. You can have a different frequency for your Facebook posts than for your tweets. 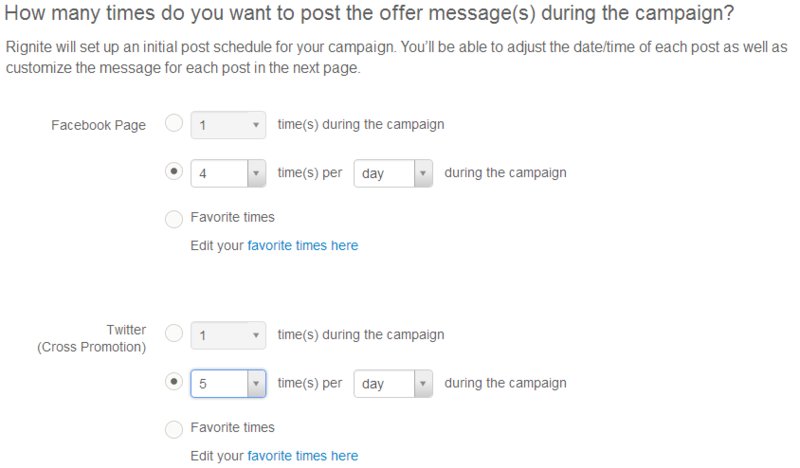 After you kickoff your campaign, you’ll have a calendar filled with posts automatically scheduled for you! Rignite is a software solution that makes it easy to schedule, track, and manage your Facebook campaigns, including giveaways, contests, and sales. 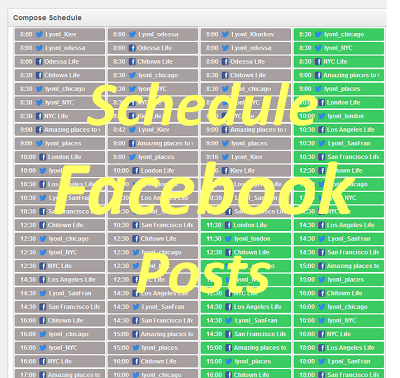 If you regularly schedule new Facebook posts you’ll often need to take a look at your calendar and make adjustments. As you make posts daily or weekly to cover current events, promotions, or news you may need to move some posts around on your calendar or add posts to maintain your targeted category mix. The Rignite Schedule module let’s you efficiently manage your post calendar for all your social profiles. You can also import a CSV file with all your posts and tweets into your schedule. Powerful scheduling tools will enable you to become a power scheduler!